If you want to raise some meat birds 'on the cheap'. . . Here's the portable chicken coop we use for raising meat birds on New Terra Farm. We like this design because it is sturdy but light-weight, easily movable by one person. We made the second one we built (see New New Terra Farm Movable Coop picture below)even stronger and lighter, because we got smarter about framing and bracing the structure. The tarp roof provides shelter to the birds. 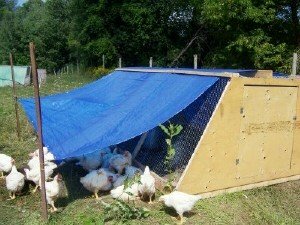 The tarp is quite a bit larger than the coop, and can be secured to provide shade and shelter when the birds are outside the coop. In the pictures below is the coop we use to raise 200-300 meat birds each year on the farm. We raise them in batches of 100, and do 2 or 3 batches each year, depending on how busy we are with other stuff. I did not include wheels on my design; I use a hand-truck (dolly) to move it quite easily to fresh ground each week. This takes about a minute. When I want to move it to a whole new field (which I do once a year) me and a couple friends lift the whole thing up and put it on my hay wagon. A smaller version could be moved in the back of a pick-up or on a trailer. I admit I'm a better gardener than a carpenter; the construction methods I use are generally pretty simple. No complicated joinery, or compound miter joints, or other stuff that adds cost and time to the construction. But the good news about that is, anybody can follow my instructions to build my Movable Coop in about an afternoon, for a cost of around $150. My design is quite light but strong; I built the one in the pictures 6 years ago and it's still going strong, although I did have to replace the tarp last year. Since (as you may have read elsewhere on this site) I consider it my 'mission' to grow farmers as well as food, I often make valuable information I have learned available to new farmers and others considering a small farm life. 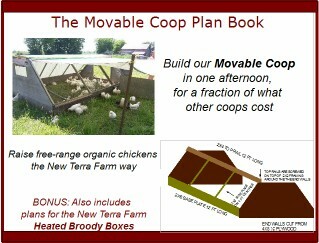 So I decided to write up the plan and instructions to build my Movable Coop so others can start a profitable pastured poultry business too. And, I've included in the package instructions for building my Heated Broody boxes; this is the same design we have used for years to raise dozens of batches of meat bird chicks until they are old enough to go into the Movable Coop. 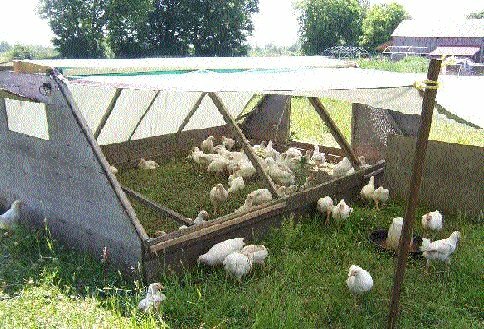 Raising pastured poultry is a good business for the small property owner; you can make 60% or 70% profit on each 'batch' of birds. And one of the secrets to raising the birds successfully is to control your losses by keeping the birds safe, warm, and secure, both as young chicks and in the field. My heated Broody Boxes and Movable Coop are what do the trick for me. I've raised dozens of batches of meat birds successfully using this same equipment. 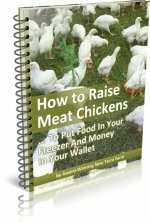 Get the plans to build my Movable Coop and heated Broody Boxes in my How to Raise Meat Chickens Combo Pack, which includes my step by step guide to raising meat chickens. Want even better deal? Get the Complete Start Farming Pack!